The Marerhof lies on 1.175 m at the foot of the Haunold mountain in Innichen/San Candido. Here sheep and nanny goats live on juicy mountain grass and spicy hay of the solar-spoilt meadows. In the Marerhof they renounce completely silage. And as excellently as the feed is also their raw milk which they return to the people. A real natural product, purely preservatives and fully in the taste. The best conditions for a particular cheese. The love to the mountainous country economy is also reflected in the processing of the precious raw milk. 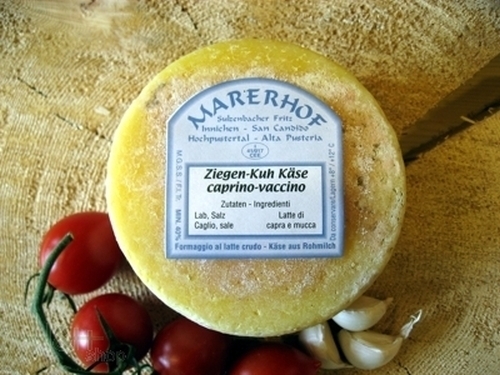 In the small cheese dairy in the Marerhof the fresh-milked milk is processed competently and warmed up on maximum 36 °. The cheese production takes place after strict quality criterions and is inspected by the South Tyrolean Cheese Dairy Union regularly. Modern processing methods pair off with old-traditional cheese recipes. However, these remain a secret- Since only on the particular taste counts. Nanny goats and sheep chese of the Marerhof count to the saneliest food of their form. In the in-house humid-cool cheese cellar the cheese loaves mature 4 to 6 weeks into the perfect lusciousness. Sehr guter Käse ! Besonders gefällt, dass aus Rohmilch hergestellt. Weiter so !! !